Sally Davies bought a McDonald's Happy Meal on April 26, 2010. She placed it on her coffee table, uncovered, and took photos every day for six months. This video shows the results, which are quite scary. Updated: McDonald's official reply. Update: McDonald's has released an official reply to this experiment. 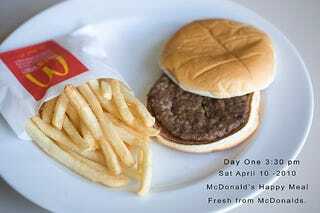 McDonald&apos;s Happy Meal Experiment Reply: Our Burgers Get Mold Too! 180 days—and she says there were no worms, mold, smell, or visible decomposition of any kind. Perhaps you have seen similar things before, but the fact that anyone can repeat this simple experiment, the fact that a burger and fries can survive through six months—including New York's fierce summer—is just scary and gross. Even more so than knowing how chicken nuggets are made and sterilized. Sally talked about his experiment to Good Morning America. What I want to know now is what kind of technology does McDonald's use to create these things. Is a Happy Meal scientifically considered inert matter? Is it made of carbon-based polymers? Can it be recycled into jet fuel? They taste marginally better than asbestos, so it must be okay to use them to build houses. 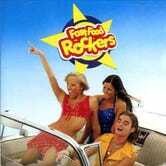 I will not do anything to stop you from buying the soundtrack for this video: It's The Fast Food Song, by the Fast Food Rockers.